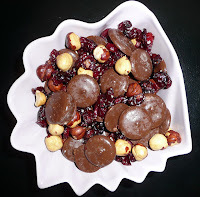 Here's a variation of the chocolate party mix recipe from Bellatrix Chocolate founder Anya Wayne that uses milk chocolate (El Rey 41 percent), hazel nuts and dried cranberries. All ingredients were bought at Whole Foods. It was scrumptious. For the recipe and instructions, see the original post here.